One of the things I continue to struggle with in my journey to health is the feeling of being torn between strictly following the AIP (auto-immune protocol), which overall has me feeling MUCH healthier than I used to, and the desire to be “normal” and indulge in a treat or a meal out. When you have food allergies and restrictions, any time you don’t prepare the meal yourself there is a risk of cross-contamination or mistakes…and if you add in ingredients that aren’t on your diet technically – AKA a “cheat” in my world – the risk to your health continues to increase further. Of course the flip side of the coin is that every time you stress out about having to obsessively plan and pack your meals, or have to turn down a tasty homemade treat or meal, your stress level, at least if you’re me, goes up. That affects your health negatively. It’s hard to feel satisfied with eating at home 100% of the time, especially when food is such a social thing in our culture. So I’ve been navigating this a lot lately. And my response varies day to day, frankly. Although I was initially 100% strictly following my diet, I enjoy allowing myself a little leniency now and then. I can afford to do this in a smart way, and your mileage will vary. The key is to keep a food journal, limit cheats so that you can track exactly what effect they have on your body, and exhibit self-control. I also recommend you try to keep cheats out of the house whenever possible. I have yet to purchase gluten-free bread for the house, for example, but I’ve had a cookie or pancake outside the house with no reaction. That way I’m not cheating daily and can keep there overall integrity of my diet. My husband and I are extremely lucky to be new Florida residents (and full-time travelers) which allows us to have inexpensive Disney World passes. 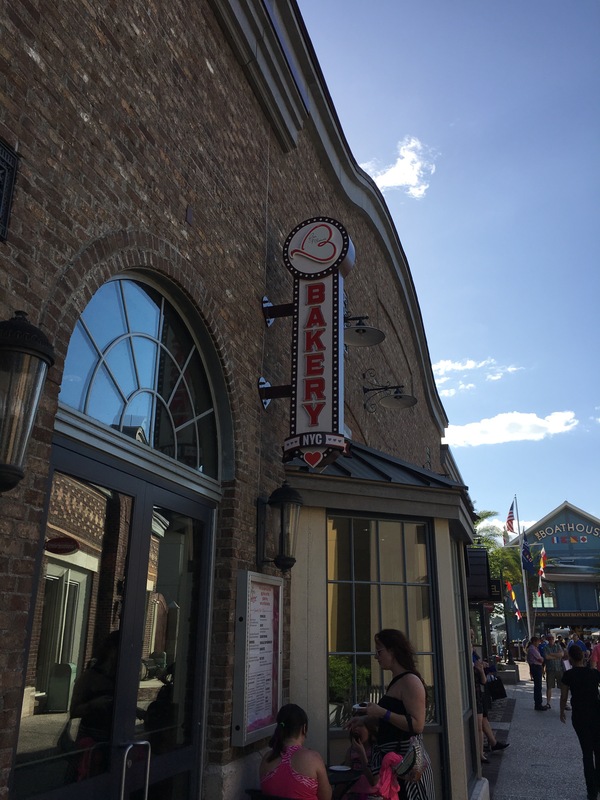 These passes do have blackout dates, so occasionally we get our Disney fix at Disney Springs, a shopping and recreation center with free parking near the parks. Yesterday we stumbled on a bakery that opened recently, and I seriously thought I must be dreaming. 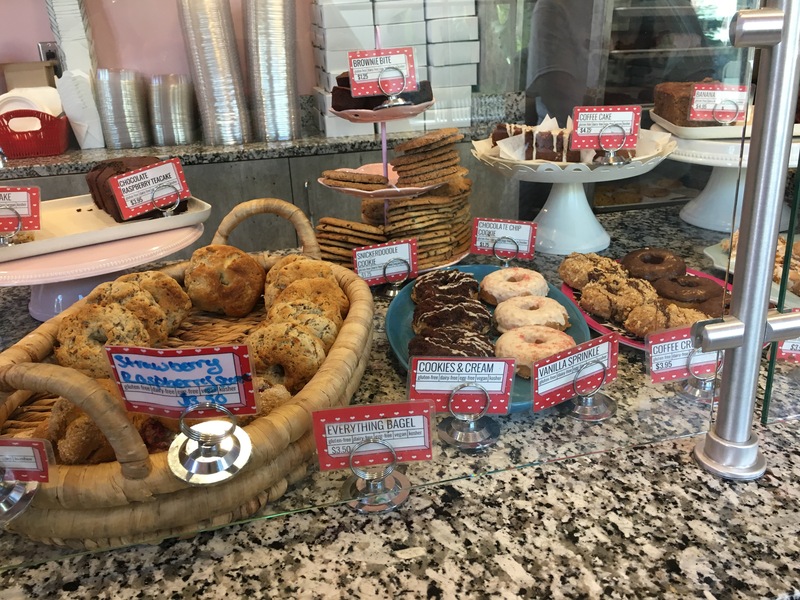 Erin McKenna’s Bakery is from NYC but now had a beautiful, small Orlando location. 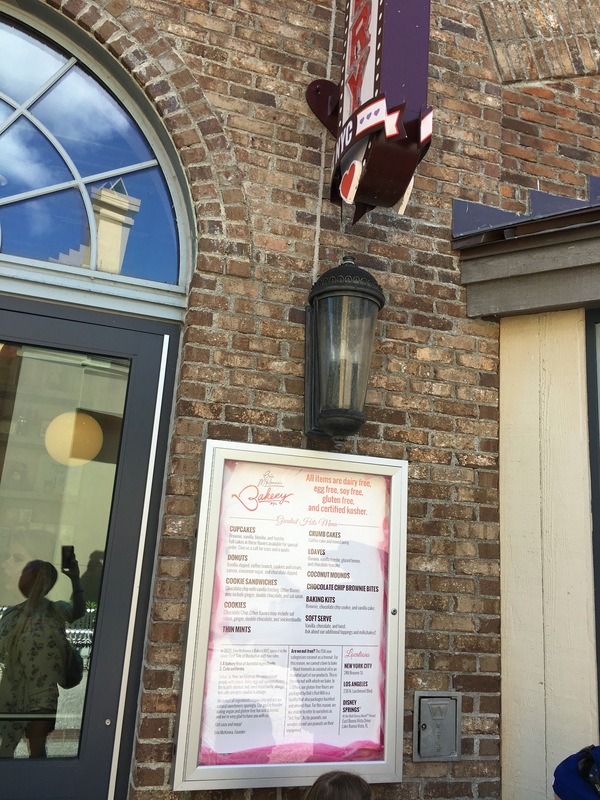 The sign outside said their food is dairy free, egg free, soy free, gluten free and certified kosher! It’s vegan too. Plus, the only “nut” they use is coconut!!! For me, that means this is the most “on plan” bakery I can imagine. Although some of these treats probably have seeds (a low level reintro for me that I haven’t completed yet), and they have more sugar than I need of course, otherwise I’m unlikely to be cheating at all. So of course I had to stop in with my husband. Their menu is almost entirely sweet treats. They do carry soft serve ice cream (I didn’t ask what it’s made of) and they have a few flavors of bagels. But the reason to go here is for the goodies, as far as I can tell. 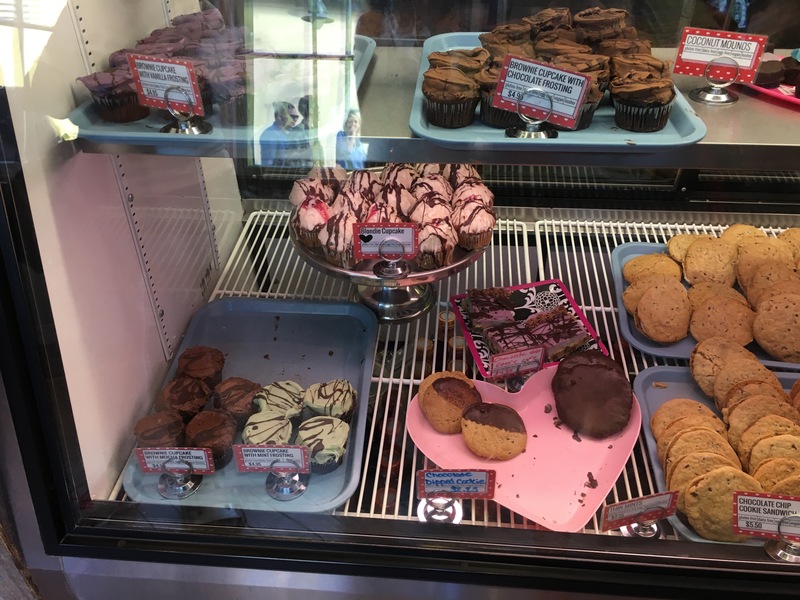 Their offerings included tea cakes, cupcakes, cupcake tops, frosting shots, at least six kinds of donuts, cookie cake, brownie treats and bites, and much more. I limited myself (and my husband, who agreed to help) to three treats. Amazingly they accepted our annual pass for a discount, so I paid less than $9 with tax. I went with a cookies and cream donut, a vanilla sprinkles donut (can you tell I’ve been obsessively craving donuts?) and a blondie cupcake with raspberry icing and jam and cookie crumbles. Everything was seriously amazing. 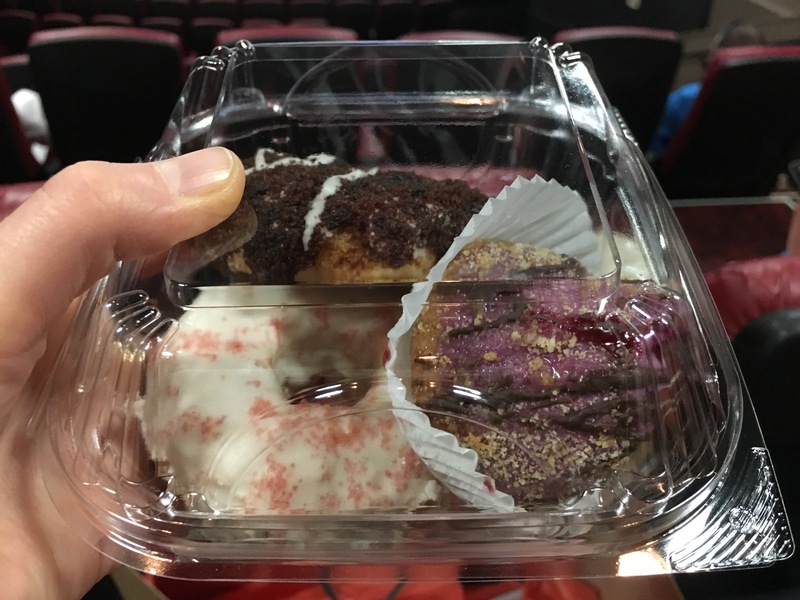 The donuts are cakey but very moist throughout, and the frosting on the cupcake top was almost fudge-like. The donuts also weren’t super-sweet which I really appreciated. Also, Mark Bittman at the New York Times has declared these the best donuts anywhere! 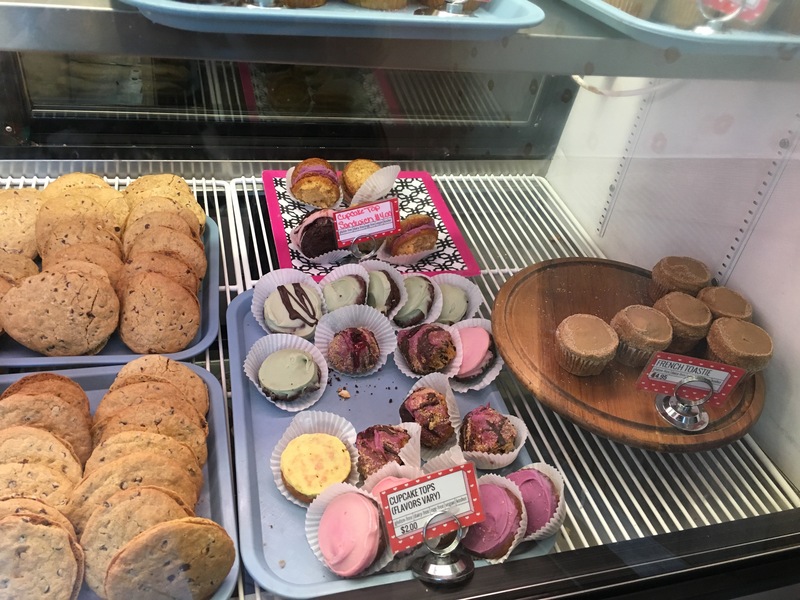 My husband, who basically eats anything, agreed he’d happily go back here for a treat, especially a cupcake or cupcake top. This is my new favorite donut place and I can’t wait to try their other flavors! I can’t recommend them more highly. Find them in NYC, Los Angeles or the next time you’re in Orlando. Or if you’re in the U.S., order a treat online! How do you navigate cheats in your meal plans? I’ll be exploring this more in upcoming posts. For me, gluten is a never again, but everything is a conversation right now.